Nuclear power could make a comeback beyond Earth if NASAgoes forward with a proposed a fission reactor in its future moon base. A fission-powered system could generate up to 40 kilowattsand give any lunaroutpost enough power to supply eight houses on Earth. More importantly,astronauts will require a reliable and steady energy source on the moon andMars. "The problem with power on the moon is that, dependingon where you're located, you may have 14 days of darkness," said LeeMason, an engineer at NASA?s Glenn Research Center in Cleveland, Ohio, whoheads the project. "We think nuclear offers some advantages there in termsof a continuous power source in sun or darkness." 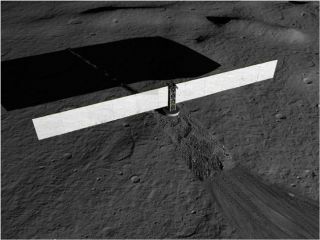 Engineers envision a nuclear reactor buriedunder the surface of the moon so that lunar soil, known as regolith, canact as shielding against the reactor's radiation. Power converters would sitatop a tower jutting above the surface, changing the reactor's heat energy intoelectrical energy for astronauts to use. The tower would also boast two 50-foot (15-meter) panelsmade of polymer composite material that could give off excess heat from thenuclear reactor. Far-flung robotic missions, such as the Cassiniorbiter currently orbiting Saturn, have relied on a different nucleartechnology, Radioisotope Thermoelectric Generators (RTG), which draws on theenergy from the natural decay of radioactive plutonium. Current RTGs produceroughly 100 watts of electricity, in comparison to tens of thousands of wattsproduced by nuclear fission reactors that split uranium atoms. NASA previously launched just one nuclear reactor into spacein 1965, but the experimental SNAP-10A reactor shut down after just 43 days ofoperation. Nuclear power made a brief reappearance in the Jupiter Icy MoonsOrbiter (JIMO) proposal, but the mission was scrappedin 2005 due to budget constraints. "JIMO was a little ahead of its time, a very ambitiousprogram, and it didn't just quite fit in with the budget projections,"Mason told SPACE.com. Now the moon base proposal offers a new possibility, butMason's NASA Glenn team must first decide which power converter engine to usefor any nuclear reactor. One design, a piston Stirling design from Sunpower Inc., ofAthens, Ohio, uses two back-to-back piston engines that cancel out each other'smechanical vibration. The second design by Barber Nichols Inc. of Arvada,Colo., relies on a closed Brayton cycle engine that has a rotary system notunlike jet turbine engines. Both power converters can produce 12 kilowatts, orroughly 40 kilowatts in a pack of four. NASA engineers hope to test the efficiency of powerconverters without the nuclear reactor in 2012 or 2013. A non-nuclear reactorsimulator would provide the heat source for the tech demonstration on Earth,courtesy of NASA's Marshall Space Flight Center in Huntsville, Ala. The space agency continues to ponder non-nuclear options suchas solar power for a future lunar base. If NASA does use a nuclear reactor,it will resemble reactor technology that the U.S. Department of Energy (DOE)"has operated for many years," said John Warren, executive head ofNASA's Space Power Systems Program in Washington, D.C.
Mason said that the project should finish on schedule if itcontinues receiving the $10 million funding shared between NASA and the DOE. "We would like to design a system that can last eightyears without any maintenance whatsoever," Mason said. "The technologyis there to achieve that."